"Fairy tales since the beginning of recorded time, and perhaps earlier, have been “a means to conquer the terrors of mankind through metaphor." Storytelling and schools are a perfect fit. 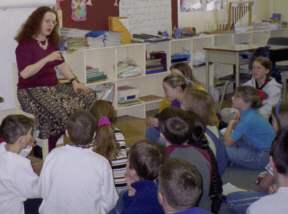 Storytelling can be used from Kindergarten to Grade 12. Some of my favourite storytelling experiences in schools have been Junior High. Storytelling fulfills many curricular outcomes. The benefits of storytelling cannot be overstated. Most of the activities I used working with Learning through the Arts in Newfoundland can be done in one class session, and work with many different age groups, including adults. Students respond stories in many ways through art, writing or speaking activities, as well as team efforts.